In a Dutch oven, heat the oil over moderately low heat. Add the onions and cook, stirring occasionally, until translucent, about 5 minutes. Add the garlic, paprika, cayenne, and oregano and cook, stirring, until fragrant, about 1 minute. Stir in the pimientos, tomatoes, squash, water, and salt and bring to a simmer. Cook the stew, covered, stirring occasionally, until the squash is almost tender, about 15 minutes. Uncover and simmer vigorously until almost no liquid remains in the pan, about 5 minutes. Add the beans and corn and cook until the corn is just tender, about 5 minutes. Stir in the basil. Add one cup of diced ham along with the beans and corn. 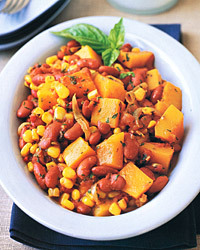 Use peeled, cubed pumpkin or acorn squash instead of the butternut squash. Gewürztraminers from Alsace have a unique combination of aromas: rose petals, ripe apricots, and musky spice. Though called dry, these wines usually contain a bit of residual sugara real plus for this dish, with its sweet squash and corn.